During the holiday season, Microsoft and Synect launched a photo booth in the world at the Microsoft Stores. The digital experience allowed store visitors to take their pictures at a custom photo station and see the pictures displayed on the stores’ 150-foot long video wall. The interactive installation ran at the Microsoft Stores in Bellevue Square Mall and University Village from December 1 to January 5, 2015. Today Microsoft and Synect released a video of the installation at the stores. The Photo Booth installation guided users through a simple process of capturing their image, using the new Kinect for Windows, and choosing from predefined image filters to create a personalized collage. The application used the images to generate a 26k video wall theme on-demand, instantly deploying it to the store’s video wall. 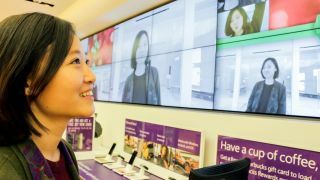 The Photo Booth installation marks the first time Microsoft has enabled users to interact with their video walls in such a direct manner. It also shows new ways dynamic, user-generated content can be incorporated into a multi display installation. Photo Booth was built by Microsoft and Synect to integrate with the store’s digital signage network. Driven by YCD Multimedia’s digital signage system, the network powers over 70 store video walls, which can have a resolution up to 57,600 x 1080. The installation included a Kinect for Windows V2 sensor, a Surface Pro 3, and a Lenovo All in One at a photo station designed and fabricated by Gensler. Plugins and custom development by Synect enabled interactivity with the video wall and allowed the experience to span across multiple devices.